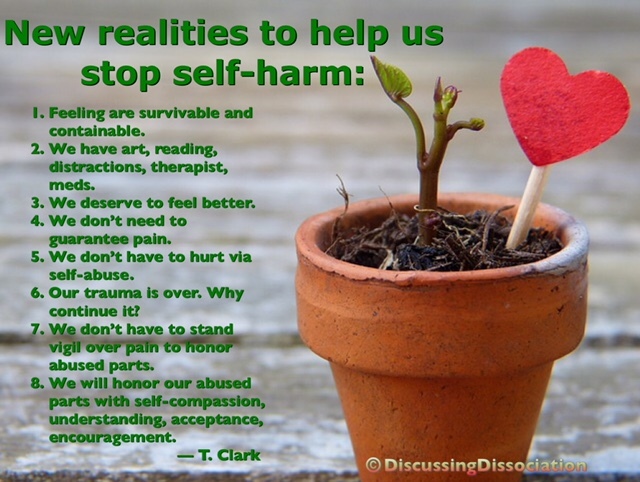 The article 25 Ways to Avoid Self-Injury and Prevent Self-Harm is one of the all-time top searched, top-viewed articles on the Discussing Dissociation blog. That fact alone proves the importance and the necessity of learning how to address self harm issues. For dissociative trauma survivors, it is important to learn how to manage all levels of intensity, from everyday life to the toughest internal challenges to the most horrific memories. And…. it’s important to learn how to manage all this emotional intensity without resorting to more injury to the self, the body, or the system. You’ve already survived a bucket load of violence. It wasn’t okay that so much violence happened to you. It’s certainly not necessary to continue or maintain that pattern of violence, not even to yourself, or toward any of your insiders. It’s also important to make sure that no one else inside your system hurts anyone else in your inside system. It’s critically important to protect ALL of your insiders, from outside harm, and from self-directed harm, and from internal harm. Self harm of any kind hurts your system. 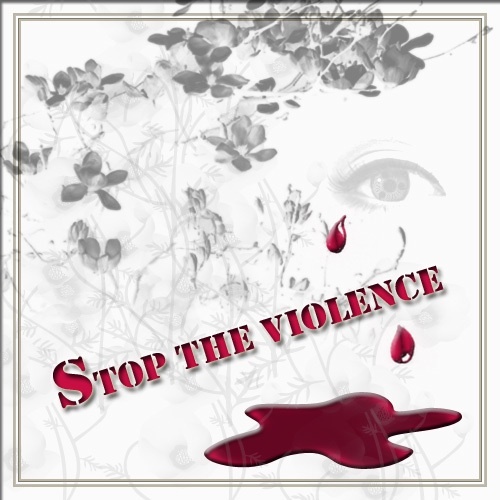 It’s violence, and the violence has to stop. It’s a big big job to learn how to not let pain and self-directed violence be your best friend. It’s a big hurdle to learn — to know, to believe — that you do NOT deserve pain, injury, violence, or punishment. These are new ways of thinking. And…. you can learn these things. Start small, but you can do it. Hopefully, these very helpful tips and ideas shared by T.Clark will make a positive difference for your day, and for your mindset. T.Clark’s words are important — I’ll re-state them here on the page in case there is any difficult reading the words on the image. Feelings are survivable and containable. We deserve to feel better. We don’t need to guarantee pain. Our trauma is over. Why continue it? We don’t have to stand vigil over pain to honor abused parts. I wish you safety and compassion in your healing journey. More ideas to try when you want to stop self-harm and self-injury. :(. She threatened to put me in hospital because of what happened. So many rules. OCD gets going and we can get overwhelmed. He is learning to remind system, “Bad feelings don’t last.” We know this true because we have evidence that no one emotion has lasted forever. Still, we want shame to not return. Shame is toxic, self-damaging, violent—sometimes like a speeding locomotive and other times like one million drops of rain that slowly bore into mountains. Too many rules to remember when times get tough like almost every day. And, still, Do No Harm is a good first rule. We did artwork more than a year ago that says that exact message. Wise, holy Crow says it in our drawing. Do No Harm. It’s hard to comply with a negative. Don’t hit. Don’t move. Don’t tell. It’s easier to Do Something. Oh wow TClark. How beautiful and elequent in expressing the despair in the various shades of DID. I so wish that there was some magic rule that we could live by to erase all of the bad stuff. Certainly Do No Harm keeps us alive but it does little to help us live. This roller coaster that we live on seems to have an endless number of drops and turns and not much climbing up out of the terror. I have to say that meditation is helping me a lot. I was just talking about it last night in my meditation group. We were talking about eyes open meditation where you say one of your mantras while being aware of what is happening around you. Well, I said that it was like a wonderful brief second of relief from the chaos around me and that I was happy to get as many of those little seconds as I could. I am hoping that I am planting seeds that may grow into minutes, maybe even hours … oh and yes I do dream about having whole days in stillness. There is so much gentleness, compassion, love and hope here TClark. Cling on to your life-line here and know that you are valued, honoured, respected and loved here. Even if you cannot feel that for yourself right now, we are holding it for you. Really good points — I especially like the idea of staying with the positives. I decided this page was a great place to add one of your quotes. Thanks for the encouragement you are offering everyone, and please know… we all understand struggles. And how difficult it gets. AND, I know without a doubt that ALL of Y’all can learn new ways, make new plans, create healthy rules, and continue to move forward in your healing. 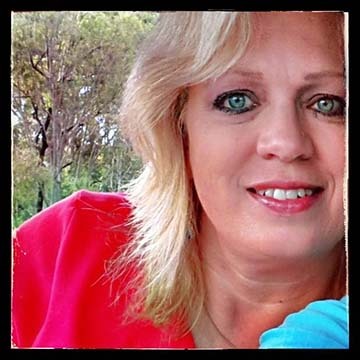 T.Clark’s quote is a great addition to this blog Kathy. And, I so agree that T.Clark makes super points, is wonderful at reminding us to stay with the positives and reflects a whole lot of good work and progress in healing. Well done here T.Clark and Kathy! Hum … I wrote a longer comment … got on a rant’n roll so I have taken that to “Our Normal Complicated Selves” blog (to be continued there) where it may be more appropriate. No you do not need to self-harm to “guarantee pain.” You do not have to keep feeling the pain. The pain was in the past. The pain should never have happened. You do not have to keep feeling that pain. You are allowed to be kind, gentle and loving with yourself and pain free. Oh … I know that it is hard … really, really hard. But you so deserve to not have to be in pain now. Is there someone who can help? Can we help here? Thank you, ma’am. You’re very nice. The body’s old math teacher from 5th grAde is being very helpful. But, they still do what they do want. I am glad to hear that you have some outside helpers. Maybe you can find some inside helpers too. I have a great helper inside. His name is Tom and he is 12 years old. He is very nice and looks after the little ones and talks with the teenagers who like to act out. They do not always listen to him but usually it helps. And he sticks up for me and tells me when some of the insiders have hurtful things planned so I can try and stop it. If you would like to talk more about who is doing the hurting or anything else, I would be very glad to listen. Thank you, ma’am. Say hello to Tom. WTFC made a blood to make a point, and made a bruise to feel. But if she does see this will I be in a heap of troubles. She’s a meanie. Tom says hi back to you. He says that he thinks that you are very brave to be writing here and hopes that you stay safe as do I. WTFC sounds like she has a lot of anger and hurt inside and does things to be seen and to feel past the numbness. I sure do understand that. My insider Victoria is like that. She has hurt us and threatened us all and acts out in painful ways. I am just trying to get to know her, to give her love and to help her see that she does not have to cause pain to feel or be seen but … she REALLY believes those old messages she learned years ago. I hope that WTFC can start to understand that she does not have to hurt you all to be seen or to feel. It may take time though for her to understand. If she does see this I hope that she knows that she can be loved too. Please stay safe Ssssh. ad we been very very sad. espeshally asher and jadie. 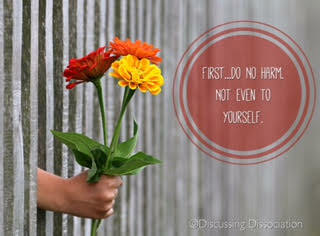 but nobody have hurted there selfs. nobody have cutted or burned or done nothing bad. To ME+WE: it’s hard to read if the box is skinny. The math teacher is trying to help, but I am scared to talk to her again because she has a second job. And I don’t like people with that job. It’s good you can talk to the people that you said. Thank you for the replies even I’m the long box. Yes it does get really hard to read the messages when they get skinnier and skinnier and skinnier. Makes some of my insiders laugh because the words look funny stacked up on one another in a skinny column. I am glad that you have someone who is trying to help. Do you feel safe saying what the second job is that scares you? Do you have anyone else in the outside or inside world to talk to or to help? I have been working for a long time to get my inside folks to talk with me and with eachother. Sure is a lot of work and sometimes everyone is quiet and then sometimes everyone is talking and I get really confused and sometimes everyone is mad or sad or just plain upset and sometimes some of the folks are playing and happy. There is lots going on and some times I get really confused. But, I want my inside folks to talk with me and tell me what they feel I need to know. Most of all, I want my inside folks to know that I love them and that really want to be friends with them. By the way, I think that you are really nice too!!! Teacher’s second job is a therapy and she has a big degree. A has to stop with the original one of that because something got bad after A tried to ask someone else to help to get over a bump in the road. The A remembered something about a teacher from where the math teacher also worked and did ask what she remembered. But, now am trying to know what to do about people with that job. I hope your peoples will be glad to have you. You are a nice person who cares. IF fhey all talk same Time, maybe have them to hold a speaking stick and then will be one at a time. Because you can’t hear anyone otherwise and that’s not what they do want I would guess. Thank you for caring. This is a hard times. Sorry that it took me so long to get back to you here. I am away on holiday and I did not have Internet connection for a few days. It really is good that you have a professional therapist that you can talk to. They really know just how to help sort things out. I am glad that you have this help. Hum … sounds like something really bad happened with a teacher. That can make you really scared of all teachers for sure. My husband had something really bad happen with police. Now he is scared of all police. He has been working on just being mad and scared at the police who hurt him not all police. He has talked with other police people to help him see that not all police people are the same. You know Sssh, I am a teacher and you know that I will not hurt you. And it sounds like the math teacher is nice and will not hurt you. So, maybe you can start to trust some teachers to be nice. I know that it takes time and lots of courage but you are certainly moving in the right direction now. Good for you!!! I am so sorry that this is hard times. Do you have a safe place that you can go to and feel warm and snuggly and away from all of the hard stuff sometimes? My insiders have a sunshine tent that they go to with their pillows, blankets and stuffies. I have a special chair that I sit in with my stuffed dog Clarence. He always makes me feel better. Say thank you for the great idea about the speaking stick. I tried it and it worked really well. My little ones had fun with it too. And my shy ones got a chance to talk. Awesome idea! I hope that you can find some peace in your day Sssh. I wish that we could all have a tea party on the beach where I am. That is what my one little insider wants to do. I am sending lots of positive, caring energy your way. No professional therapy now becsuse big argument because A spoke to someone else and made the original lady mad and they anyway scare me, ms teacher. Thank you for saying you would not hurt. But, they don’t all and the one that was remembered is ok in the grand scheme but he smelled of coffee and the door was locked. I am sorry about your husband but so glad he did try to fix his ideas. Also it’s good your peoples have a nice place. I only did find out I am a piece of the person pizza. Math teacher did explain. So, now am just hiding for a while. We have a real dog who is Clarence. Lol. Like your toy. He is big and black. Good you are by a beach and hope you have a tea. Bring towrls for swimming. You are nice and sure write to lots of people. I’m grateful to be one and sorry for this one I think it’s a funny time where I am and I should be sleeping. Professional folks can help a lot. But, sometimes they have a really hard time understanding us. I am glad that you have someone to help (the math teacher). I find it really hard to figure things out on my own. My T helps me a lot. Oh and I love the idea of a person pizza. My little ones especially my little one whose name is Squirrel really like that they are a part of a person pizza but they think that they all have different toppings. Squirrel has jelly beans on her piece because she thinks that they are edible silly beans and she is all about silly beans. Oh and you have a dog named Clarence!!! Wow!!! That is so cool. I wish that I could have a real dog and cat. I am allergic to them. I love animals especially Squirrel. She calls friends and asks for play dates with their dogs and cats. We carry a mouse on a string in my purse in case there is a cat to play with. I absolutely would NEVER hurt you. You deserve to be loved and cared for and to have all kinds of fun and happy things. I am sorry that anyone ever hurt you. That was wrong, wrong, wrong. They were bad people to do that. You are special and precious and deserve only love and caring. Maybe you can pretend to come to the beach with me and play in the sand and go swimming. My little ones have towels that match their blankets. One is pink and silver, another is white, another is blue with yellow stars and Squirrel … hers has a giant lobster on it. She put it over her and pretends that she is a lobster crawling up the beach. I enjoy writing to you very much Sssh. I hope that we can be good friends here. This is our safe writing place. We can talk from our hearts here and tell our truth. You do not have to hide here. You are safe here and not alone. Thank you for your nice note and being kind to me. Does squirrel like to swim? I do and would take her in the water beaus I have goggles. I have a spongebob towel, but lobsters are cute. We don’t eat them because not kosher. You are so nice to everybody and do I hope peoples are nice to you back so you can be filled up. You are very special. I just had a really long day traveling and looking after things (like my mom who is 88 years old and on the trip with us … actually the trip is for her). So, I may be brief here and not too with it. Stress is big here right now. But, I want to say that it is not hard at all being kind to you. I really, really like you and am so very happy to be able to talk with you. You are so very special and precious and I am just so honoured that you want to talk with me!!! My inside folks LOVE Spongebob and especially Patrick because he is so funny. So, yes please bring your Spongebob towel to the beach with us. And yes. Yes, yes they all love to swim especially Squirrel and my fellow Tom (he is 12 years old and is really nice and is very kind and gentle with little ones so you do not have to be afraid of him). My little folks all live on the beach inside. That is just how things evolved. Going to a real beach now is a real treat for them. I hop[e that you and your inside folks all have a nice place to live. Hum … it is REALLY scary when things come out and inside folks talk and tell their truths. Some inside folks do not want the secrets told. They have been told by the bad people to keep them secret. Maybe even the bad people said really bad things to scare them and make them not want to tell. That is okay. We have all had that happen here. One of my bad people said really bad things about what he would do if I said anything. Cruel things. Not nice things. Thy were lies. The bad people cannot hurt you now I hope. Are you away from them? That is the first thing to do. Get safe oaky. I really want you to be safe. You matter to me. I want you to have all of the nice things that you deserve. Every time I write here I am filled up to overflowing. This community is so wonderful and sacred to me. Everyone is so special beyond words to express. You are in my heart and my thoughts Sssh. You are not alone. You are heard. You are special. You are precious. You are welcomed. You are admired. You are beautiful you!! !